Successfully Added Command Center 8-in Touchscreen Monitor (PC, POS, Media Remote) to your Shopping Cart. 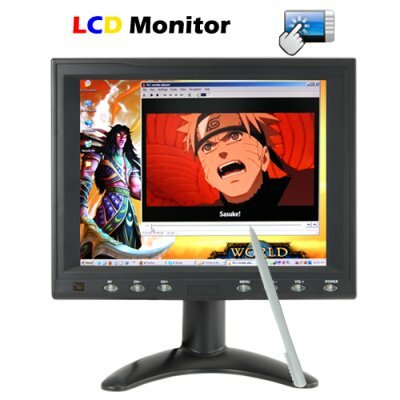 This LCD display provides all the functionality of your regular PC monitor, but goes one better - TOUCHSCREEN! Small and powerful, this 8 inch wonder is the perfect size for home, office, or business use. Transform the way you work and play with The Command Center Touchscreen Monitor! FOR HOME ENTERTAINMENT: Set up a PC with all your downloaded media in it (movies, TV shows, anime, dramas, music videos) next to your big screen TV in your living or family room. With the Command Center Touchscreen Monitor control your computer so that it plays whatever audio and video content you want on your TV. The Command Center is the next stage in DIY customizable home entertainment solutions! FOR OFFICE PRODUCTIVITY: It's great to have two monitors, but desk space is a premium. Also you really only need one for email while the bigger one is for web surfing and business applications. This 8 inch LCD touchscreen monitor is the perfect solution when desktop real estate is scarce. More importantly use your finger and mouse at the same time to double your productivity! FOR BUSINESS: This miracle of display brilliance is the perfect POS (Point Of Sale) business solution! Lost orders, human math errors, and other costly delays will be a thing of the past. POS screens aren't just transforming the food and beverage industry (bars, food court shops, coffee and donut stores, etc. ), they're revolutionizing how quickly business is done in the entire retail business realm. Gas and petrol stations with customers lining out the door. Double and triple your volume and keep your customers happy with this touchscreen solution! It's also great for mall booths and kiosks selling everything from lottery tickets to cigarettes! Whether you're in retail sales or provide consulting solutions for the industry, add this point of sales phenomenon to your arsenal to increase sales, improve the customer service experience, and minimize cash transaction losses. This is great for artists and graphic designers. Why waste time sketching out your ideas on paper and scanning them when you can now sketch right on the screen! Kids will love it too. Open up Microsoft Paint and let them screen finger paint! Great for hours and hours of fun! Great for multitaskers! Tap and click at the same time. For example, you can finger drag icons around the desktop with your left hand and mouse click open files with your right hand. Instantly double your productivity! A great addition to my information technology course. I can correct student errors with ease and point them to places of interest. It has been so popular with students I'm going to install five more and will eventually have one per computer.